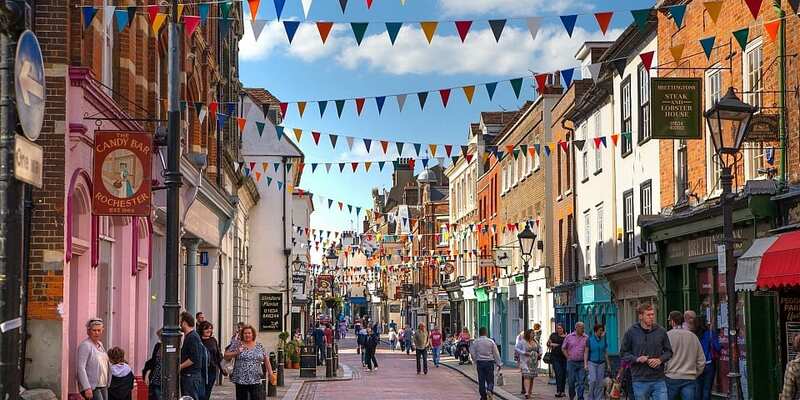 Are top savings rates hiding on your local high street? It’s been a tumultuous time for savers, with a record numbers of bank branch closures, the arrival of online-only challenger banks and a shift to cashless transactions. But despite the rise of technology, are some of the best deals available by popping into your local branch? The rise of digital banking has made things difficult for savers who can’t – or simply don’t want to – manage their money via apps or websites, and could mean that some customers are missing out on the most competitive savings rates. But, depending on where you live, there could be little-known bonuses offered by your local building society branch, as several regional providers give top rates to those who live nearby. And in some cases, these rates beat those from all other nationwide and online accounts. Here, we look at where you can find the best savings rates, whether you choose to bank in-branch or online. Are the top savings rates only offered online? When it comes to standard fixed-rate savings accounts, you’re likely to benefit by going online to find a savings deal. The tables below show the top rates for fixed-rate savings accounts and instant-access accounts, ordered from the highest to lowest AER. All the accounts can be opened by anyone throughout the UK. These rates can be compared with the table below, featuring the top-rate accounts that can be opened in person at a local branch. The two-year fixed-rate account from Al Rayan Bank is the only one to feature in both tables, as it offers both online and in-branch access. All the other online accounts can only be opened online. In every instance, apart from the two-year account featured in both tables, all of the highest rates can be found online. If you’re locking away your money for five years, opening the top online account would mean a difference of 0.45% compared with the top account you can open and manage in-branch. And someone with less than £1,000 to save wouldn’t be able to access any of the top rates if they wanted to open an account in-branch. The Marcus by Goldman Sachs account can be opened with just £1, but it only operates online – which means those without easy internet access could be losing out. What about regional savings deals? The in-branch accounts we’ve looked at so far are available nationwide. But regional providers can sometimes offer eye-catching deals. Certain banks and building societies only serve those living in the community where they’re based. Having a smaller customer base means that these types of financial institutions can sometimes afford to pay higher rates. These deals may not show up on some comparison sites, which often limit their entries to nationwide deals only. By way of a direct comparison, we looked at the top three fixed-rate accounts that can be opened and managed in-branch, and have regional restrictions in place to open them. Mansfield Building Society five-year fixed-rate bond 2% £500 minimum initial deposit. For residents in Nottinghamshire, Derbyshire or South Yorkshire. Vernon Building Society three-year fixed-rate bond 1.85% £1,000 minimum initial deposit for annual interest; £5,000 minimum initial deposit for monthly interest. Only available to those who live within 25 miles of Stockport. Ipswich Building Society two-year Blyth Bond 1.4% £100 minimum initial deposit. Only for those who live in postcodes IP, NR, CO, CM, CB and PE. Source: Moneyfacts. Correct on 19 November 2018. As the table shows, these fixed-term accounts don’t match the top rates offered by online or nationwide accounts. But when you look for more specialist accounts, you can find hidden gems. By comparing savings providers that only cater to local customers against accounts with no restrictions, we found several instances where people in certain areas of the UK could get much better rates with their local building society than with a big bank. The top three Help to Buy Isas are all from regional providers. The Penrith Building Society Help to Buy Isa offers 3% AER, while Tipton & Coseley Building Society gives 2.95% AER, and Vernon Building Society’s Help to Buy Isa gives 2.58% AER. To apply with Penrith Building Society, you need to live in Cumbria. Only those with postcodes beginning with B, DY, WS or WV can apply for the Tipton & Coseley Building Society account, unless you’re an existing customer with an account that was opened before 23 May 2016. And for Vernon Building Society, you must live within 25 miles of Stockport. This is compared with the top-three nationwide accounts: Barclays Help to Buy Isa, which only pays 2.58% AER, followed by Newcastle Building Society Help to Buy Isa at 2.56% AER, and Nationwide’s Help to Buy Isa with 2.5% AER. This means that a first-time buyer living in Cumbria could earn 0.42% more interest to put towards their first home than someone living elsewhere. You could also find a better deal with a regional bank for children’s savings accounts. Melton Mowbray Building Society’s Wild Ones Young Savers account pays a top rate of 3.04%. There’s a 30-day notice period, and you have to live in Leicestershire, Nottinghamshire, Lincolnshire or Rutland to apply – or you must have been a customer for five or more years. This beats the top no-restrictions account from Nationwide Building Society – the Future Saver account pays 2.5% AER, and only allows one withdrawal per year. However, if you’re an existing Nationwide customer and open this account, you’ll get a preferential rate of 3.5%. This means that, unless you’re an existing Nationwide customer, money saved for your child could earn 0.54% more if you qualify for the regional account. We also found that banks with regional restrictions all pay better when you take out regular saver cash Isa accounts. Vernon Building Society offers a regular saver Isa that pays 1.95% AER when you save between £25 and £500 a month, along with a £500 minimum initial deposit. Plus, if you’re a first-time buyer you can get an extra bonus of up to £1,000. However, you’re only allowed to make two deposits a year, you have to open the account in-branch and must live within 25 miles of Stockport. Ipswich Building Society’s Monthly Saver Isa pays 1.8% AER when you make an initial deposit of between £10-£1,666.66, and subsequent deposits between these amounts each month. You cannot transfer from other Isas, and must be a resident in postcodes beginning with IP, NR, CO, CM, CB or PE. Lastly, Progressive Building Society’s Clockwork Regular Isa Saver gives 1.65% AER on balances when you make an initial payment of at least £20, and subsequent monthly payments of between £20 and £1,666.66 each month. You must be a resident in Northern Ireland to apply, but the account can be opened in-branch, via agencies or by post. These all beat rates offered by banks with no restrictions on residency. The top rate on offer comes from Furness Building Society’s Regular Saver Isa, which pays 1.5% AER on a minimum initial deposit of £1. You can save up to £1,666.66 a month and must make at least one deposit between £1 and that maximum each month. But note that, while you can live any where in the UK, the account does have to be opened in-branch or via an agency – so your access may depend on whether you can get to a location. In this case, those who qualify for the top-rate regional account can earn 0.45% more in interest than those who opt for a nationwide account. Should I go for a regional account? The benefits of opening a regional account really depend on where you live, whether your local bank or building society is offering a good deal, and whether you’re comfortable with opening and managing an account online. For those who prefer to speak to someone in person and need help setting up their bank accounts, a local bank branch is likely to be better, even if your rate is slightly lower. If you don’t live near any banks with competitive regional offers, and you’re okay with the idea of managing your money online, then the likelihood is you’ll find a lot more choice and competitive rates by searching for an online account. You can use Which? Money Compare to search through hundreds of savings products to find the right one for you.